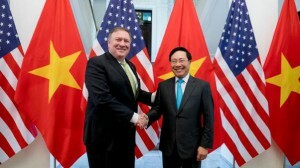 US Secretary of State Mike Pompeo raised the issue of a detained American man of Vietnamese descent during meetings with senior Vietnamese officials in Hanoi on Monday, a US State Department spokeswoman said. Pompeo was in Vietnam’s capital to meet with the Vietnamese leadership and discuss North Korea following two days of frosty talks in Pyongyang aimed at persuading leader Kim Jong Un to give up nuclear weapons. “The secretary also raised the case of William Nguyen and encouraged a speedy resolution to his case,” US State Department spokeswoman Heather Nauert said in a statement. William Anh Nguyen was detained last month in Vietnam’s HCM City following mass protests sparked by concerns that plans to develop economic zones by offering land leases for up to 99 years would be dominated by investors from China, with which Vietnam has a history of fractious ties. Nguyen was “gathering and causing trouble” in HCM City and was filmed on camera urging others to climb over barricades, the state-run Vietnam News Agency reported. Video footage of Nguyen shared on social media showed he had blood on his head during the June protest. The Vietnamese government has denied any use of force against Nguyen and has allowed US consular officials to visit him in detention.